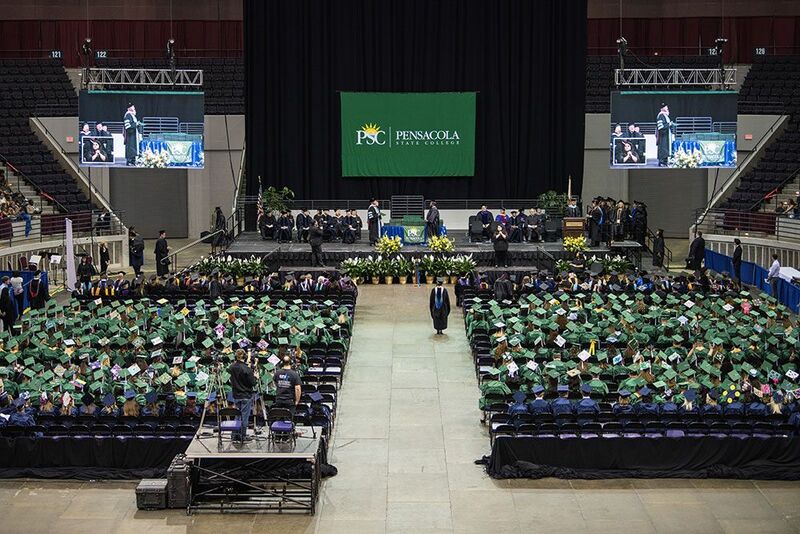 Pirates Baseball Coach Bryant Lewallyn said the video was a team effort. “It was raining the day the Wahoos announced the contest, the little canoe was over in the maintenance department and one of our players had a fishing pole in his car – so everything came together perfectly,” he said. 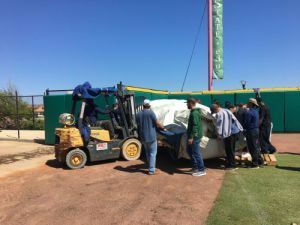 On Wednesday, March 14, the Pirates picked up the 170-foot-by-170-foot tarp from the Blue Wahoos. It will be used to cover the field when it rains during games and practices. 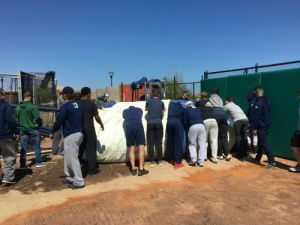 “We’ll be able to play more often and if there are periods of heavy rains during practices, the field won’t get soaked and we’ll be able to practice more,” said Lewallyn who added baseball games usually get rained out about five or six games a season. “Some years, you don’t miss any games because of rain outs and some seasons you can miss nine or 10 games because of rain,” he added. 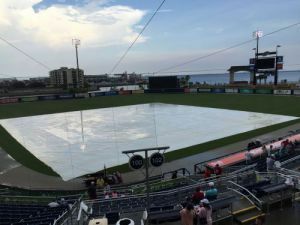 Ricki Stewart, community relations and public relations manager for the Blue Wahoos, said they were flooded with emails from across the country. She added the Pensacola State team also posted the video on its Facebook page and tagged the Blue Wahoos. “Not everybody did that and when the Pirates did, we were able to share the video on our Blue Wahoos Facebook page too,” Stewart said. The Pensacola State players were very excited to win the tarp and look forward to using it. Rulli, a catcher who portrayed the fish in the video, said he and teammates felt the video was a winner. Bryant, a pitcher, said not winning the field tarp was never an option.